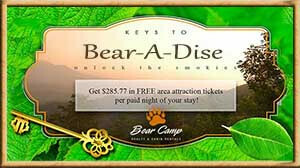 Pigeon Forge Lodge - Bear Camp Cabin Rentals. "Pigeon Forge Lodge" is a newly renovated chalet and is one of a kind with over 5,000 square foot and was professionally decorated by award-winning Donovan Swick! Located only .2 miles from the Parkway in Pigeon Forge where you could walk to restaurants and shopping and has all the amenities you could ask for. There is plenty of parking for 10 vehicles comfortably with a circle driveway at the main entry and an additional lower level parking where you can access the chalet through the game room. This chalet would be considered motorcycle and trailer friendly at the riders’ discretion. If you are wanting to be close to all the area attractions with no mountain roads, then "Pigeon Forge Lodge" is the perfect place for your next mountain vacation. "Pigeon Forge Lodge" is a stunning 6-bedroom 5 1/2-bathroom with custom built showers which have beautiful glass doors and will sleep 34 comfortably. There are no steps to enter the main level, but when you do you are going to be taken back by all the beautiful decor and the spacious floor plan. On the main level, you will find a large eat-in kitchen with an Island Bar, all new stainless steel appliances and granite counter tops. The massive dining area is 26' by 15' and holds an 18' long dining room table that will accommodate 22 people. There is also an additional dining table in the kitchen which will accommodate 4 or more people. Just off the kitchen is a cozy bar lounge with a comfortable couch to relax on after a long day sight-seeing or kick back in one of the 2 chairs while watching your favorite show on the Flat screen TV which is WiFi only. You will also find the living room and a ½ bath on this level with 2 oversized comfy couches to stretch out and watch your favorite movie on the Flat screen TV or unwind in one of the 2 lovely leather chairs. As you travel from the living room down the hall you will find 2 bedrooms, one bedroom will have a King size bed with a Flat screen TV and the other bedroom will have a Queen size bed, Flat screen TV and a love seat with a full-size sleeper sofa. These 2 bedrooms will share a full bathroom with a walk-in shower only. The upper level has 4 bedrooms with 2 of those bedrooms being Master Suites. One of the Master suites will have a beautiful white finished King size bed, a Flat screen TV, a love seat with a full-size sleeper and a very large private bathroom with double vanity and a walk-in shower only. The other Master suite will have a gorgeous dark wood King size bed, a Flat screen TV, a love seat with a full-size sleeper sofa and a very large private bathroom with double vanity, a walk-in shower only and a make-up vanity area with natural lighting from the oversized windows. This bedroom will also have access to a small balcony with a table and 2 chairs where you can enjoy your morning coffee. Adjacent to the Master Suites is another elegant bedroom with a stunning King size canopy bed, Flat-screen TV, a love seat with a full-size sleeper. This bedroom will also have access to the small balcony where you can enjoy a nightcap before you go to bed. This bedroom will use a separate bathroom with a tub/shower combination. As you travel down the long hallway you will find another bedroom with 3 stunning Queen-size rod iron beds, 2 love seats with full-size sleepers, a 70 in Flat screen TV with a PS4 and 2 controllers (with Fortnite and Apex Legends installed) or bring your own games and enjoy. This bedroom will have its own large private bathroom with double vanity and a walk-in shower only. As you travel downstairs, get ready to be amazed!!!! There is a large game room with a stand-up Pac-Man arcade game with 60 different games, a Foosball table, a unique 3D Pinball Machine with over 400 games, a Flat screen TV with a PS4 and 2 controllers (with Fortnite and Apex Legends installed) or bring your own games and enjoy. There are 3 comfortable leather futons you can use for seating or sleeping. Just off the game room, you will find a 50’ by 25’ gym with 20’ ceilings where you can play basketball, or it has plenty of other uses as well. YOU MUST SEE IT TO BELIEVE IT because it is one of a kind!!!!!!!! If you like to do outdoor activities, there is a nice level, fenced in back yard for you and your family to enjoy. After a long day at Cal Ripken or Dollywood, enjoy the brand new bubbly hot tub to soak all your cares away. If you enjoy grilling out on those spring or summer nights, there is a brand-new gas grill for your use, just bring your favorite food to grill and you’re all set. Also, enjoy the 3 picnic tables or the 3 gliders while you wait for your food to cook and then enjoy an evening eating under the stars. If you are looking for the perfect mountain vacation where you can relax and unwind with family and friends and have everything you want and need in the cabin, then look no farther than “Pigeon Forge Lodge” for your next unforgettable mountain vacation. This chalet will be one you will never want to leave and will make you want to come back to year after year for more lifetime memories. What are you waiting for? Book this gorgeous, unique chalet today before it is too late!!!!!! !